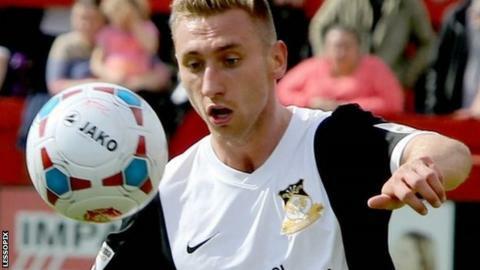 Kevin Wilkin says Wrexham will appeal against striker Louis Moult's red card in Saturday's 3-2 defeat against Altrincham. Moult was shown a red card in first half stoppage time only two minutes after scoring Wrexham's second goal. Manager Wilkin felt Moult's second dismissal of the season, for an alleged stamp on Simon Richman, was harsh. "We'll appeal the sending off," said Wilkin, "and hopefully that will be rescinded." Andy Bishop was also sent-off for two yellow cards in a game which saw Altrincham come back from two goals down to win 3-2 at the Racecourse. Wrexham have now gone eight league games without a win and their last victory at home to Kidderminster Harriers in September. The Dragons travel to Kidderminster on Tuesday and Wilkin says his players cannot "feel sorry for themselves" following Saturday's defeat to Altrincham. "We have to look forward," Wilkin added. "Kidderminster is an opportunity for us to hopefully get back to winning ways and go and do the job we know we're capable of. Midfielder Dean Keates, on loan defender James Pearson and goalkeeper Andy Coughlin will not feature against Kidderminster, but Wilkin is hopeful fellow midfielder Jay Harris will be available.